Weavers dream - get away! This beautiful little basket is wonderful introduction to weaving with painted paper. Students will weave a clover leaf base and learn how careful color placement of stakes creates a distinctive ripple design. The ripples continue up the sides. The rim is double lashed with waxed linen. Teacher will provide a wide choice of paper (painted and pre-cut). Students will receive materials for two baskets. Students should bring a #22 tapestry needle, sharp scissors, several toothless alligator clips and a small bent tip packer. This beautiful stepping weave pattern includes 3/3 twill and over 1/under 1 weaving to create an eye catching design. Start with a herringbone twill base. Then choose from a variety of color options to weave two different colors up the sides. Work on spoke placement and weaving tension to keep the shape. A notched handle will top the basket for easy carrying. Double lash the rim with waxed linen. 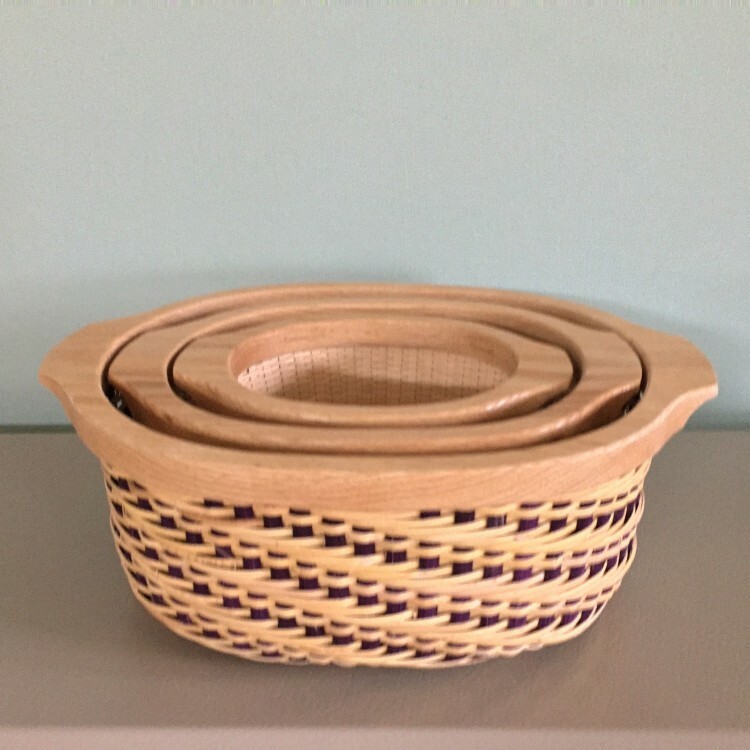 Shaker Cheese Basket - This unique basket is woven with flat reed in a different style of weave making the hexagon weave pattern. Traditionally a shallow basket that was used by Shakers as a strainer to make cheese. Choice of two different sizes. 8" or 10" base. Students will weave one of these race track shaped trays on a mold with cane spokes and weavers, topped off with a hand turned wood rim to match the base. You will choose from a variety of weaving patterns in class. Read measurements & compare to a ruler for project size, as pictures can be misleading. If you have a task light, please bring it as some areas may have poor lighting. To order extra kits from any of our teachers let us know with your registration, you will pay the teacher at the time you pick up the kit. An attractive tote made to hold up for daily use. The sides of this tote are woven in a 2/2 twill, which makes a direction shift at each corner. The overlays are added to spice it up. Finished off with leather handles to match your overlays. Stakes are black, choice of red or turquoise overlays and handles. Woven over a mold for the perfect shape; choose from a variety of dyed reed to use for the spokes. Learn a cat head base and continuous twill up the sides. Learn a match stick rim – NO cutting and tucking and NO lashing! The mold used will be for the student to take home to use to make the basket again! This shallow heat and fold Birch bark bowl is stitched with finely split and prepared spruce root. Then, an over lay of Willow, White pine, or Cedar barks ( or a combination of) is added to form the hexagonal weave portal. The rim consists of 3 Cedar bark elements buttonhole stitched with waxed cotton cord to nicely conform to the outward angle of the edge. This is my most favorite twill basket yet! The large size holds everything you will need to take on an outing. The two swing handles provide easy carrying. The fun play in color in the spokes and weavers make horizontal stripes on the outside of the basket and vertical stripes on the inside of the basket. Color choices will be available. The basket is lashed with waxed linen. Students will start with a gourd that has been cleaned, dyed, and drilled to allow for a full class of creating. Students will learn a couching/coiling technique with Danish Cord and waxed linen to create a one of a kind gourd vessel. Add natural materials for embellishment, feathers and beads. We will discuss growing, cleaning and dying of the gourds. A fun class, unique project! This is a fun project, woven on leather cord with stone or glass beads. A hot fashion statement right now! This “Ladder Woven” wrap bracelet is a fun bracelet to weave and lovely to wear! Tools required: Sewing scissors and Ott light may be helpful. Dimensions: 20+” L x ½” W x Length to wrap 3 times around your wrist. *Fee includes everything except the beads. A huge selection will be available - prices average from $5 to $20 per bracelet, depending on your selection of beads and if you wish for a fancier button, rondelle or charm/drop/bell to finish with. Plenty to please everyone! The base begins with a vintage spigot handle, threaded with Cedar bark. Twine the base with waxed cotton cord and iris leaves to upright. Using thinner cedar and wider willow bark learn the fun and challenging Japanese knot weave. Height is variable depending on the rows of knots and twining. A basic braid track boarder completes the piece. Students should be able to either complete or nearly complete in class time. Students may elect to make the piece shorter or taller to adjust time frame. Diagonal Plaited Basket: Learn the technique of diagonal plaiting and find out how fun and easy it really is to weave. Students will use dyed reed of Navy, Gold, Cranberry and natural or Black, Gray, Teal and Natural. You will not have to read a pattern or follow a chart. 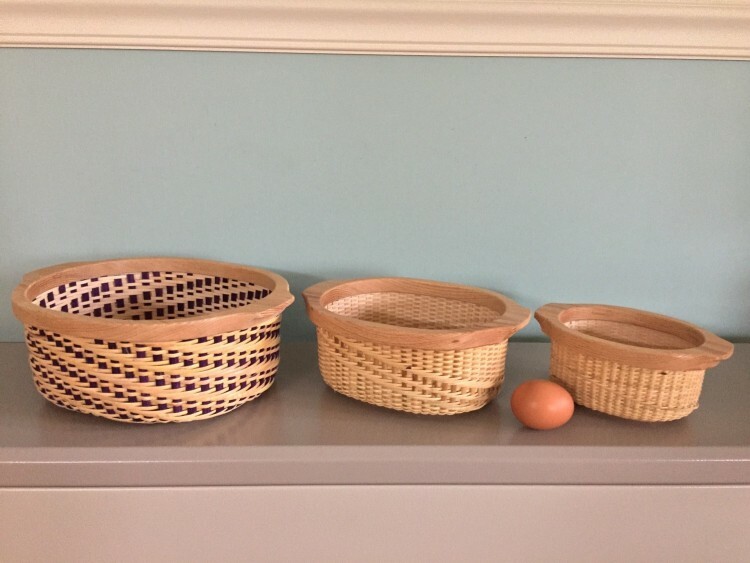 This basket is additive and you won’t be able to stop with weaving just one! Students will learn traditional Haida weave techniques and designs using finely, hand prepared Alaskan yellow and western red cedar from Thorne Bay, AK. Beautiful Large Abalone specimens are included. You will learn a square to round start, Adding warp (spokes) and a sweet border at the top! A large selection of beads available to add an extra sparkle to your treasure! Waxed linen twining experience is a great base to learn from. Harvest and preparation will be discussed. Materials will be finely prepared, but may allow some chance to experience fine tuning. Twining experience is a MUST. The base of this bias weave consists of wider birch strips and narrower willow strips. The top edge is saw tooth and tucked securely. The spruce root doubles as a rim/wall hanger handle. Thrift a small vase liner for a nice wall bouquet. Material will be provided for a 2nd basket with wider willow and narrower birch. SPECIAL TOOLS: Good Sewing Scissors for cutting thread and an Ott light may be helpful. The rest will be provided! Click here for a printable PDF of classes. Click HERE for a printable PDF registration and class choice form for mail in registrations.